Josephine Montfort is from one of New York's oldest, most respected, and wealthiest families. Like most well-off girls of the Gilded Age, her future looks set - after a finishing school education, she will be favourably married off to a handsome gentleman, after which she'll want for nothing. But Jo has other dreams and desires that make her long for a very different kind of future. She wants a more meaningful and exciting life: she wants to be an investigative journalist like her heroine Nellie Bly. But when Jo's father is found dead in his study after an alleged accident, her life becomes far more exciting than even Jo would wish. Unable to accept that her father could have been so careless, she begins to investigate his death with the help of a young reporter, Eddie Gallagher. It quickly becomes clear he was murdered, and in their race against time to discover the culprit and his motive, Jo and Eddie find themselves not only battling dark characters on the violent and gritty streets of New York, but also their growing feelings for each other. This isn't the gothic novel I expected from the blurb or the cover. There are dark aspect to this book, but really it is a historical mystery fiction. It really is a character book and while I loved Josephine's growth in the book, I did have a few problems with it. Really only one. She was terribly naive. Now, I did expect someone who is very sheltered to be naive, but she supposedly wanted to become a bluestocking and read accounts from Nellie Bly and had several papers snuck in by trusted servants. So, when she didn't know what a madam was or what she did with the girls, it did annoy me a bit. Not because she didn't catch on right away but because it seemed labored upon more than once. Even after it was fully explained to her she still had another incident where she was more naive than she should have been. I also didn't like Eddie. He was fine at first but when he wanted her to give up her life for his, I thought it was very selfish. He knew what she would be giving up and he also knew she didn't quite have a clue. So, I found him very self-centered. This was not the only reason I didn't like him and toward the end I wanted someone else for Josephine. I hope that doesn't give too much away since the romance was secondary to the mystery at hand. Now the mystery was done rather well. I really enjoyed how that played out and how it twisted within the story. In fact, I did guess one aspect of the mystery but not the others. I also didn't mind the Scooby Doo ending where the bad guy explains why they did it. There was even a "if it wasn't for you... (read crazy kids)" in there. LOL I did find that entertaining. I give this book 3 stars. I did like Jo's growth and the mystery within the book. I enjoyed the historical references as it pertained to women at that time. I also loved the secondary character of Fay and how her mystery came about. I did have some problems with the romance but those who are reading the book for the mystery and history will enjoy this story a lot. It sounds as if this was both a hit and miss for you. Like you reading the synopsis I was expecting something a bit more Gothic. A disappointment for anyone really into their Gothic novels but as I love my historical fiction anyway I'm sure it wouldn't have posed too big a problem for me and I'm sure I would have really enjoyed the issues pertaining to women at that time. I think you would have enjoyed it more than I did, and you are right, it was a hit and miss for me. Jo was annoying, too young for her age. The romance was...well felt fake. I never understood, it was never explained. Remember when her uncle tells her he heard this irish boy say he was using this girl for a story, Eddie denied it, but...what really happened than? So true. The false story bugged me but not so much I didn't feel it linger. I just felt that the uncle was trying to put a wedge in it and you were just supposed to assume as much. 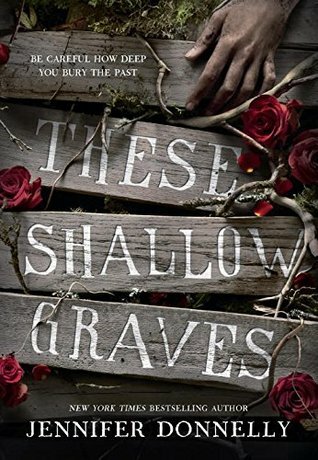 This wasn't near as creepy or as dark as I was expecting either but like you said, it was still a good historical mystery in the YA genre. I was disappointed that it wasn't dark but I did like the mystery. I picked this up at BEA and then took a pass after I read a few reviews similar to yours. I'll have to look again since I keep seeing much more positive reviews than mine. Sigh... I have a copy of this book, but I continue to read reviews like yours that point out the flaws, and I think I am going to skip it. Thanks for the helpful review. The Scooby Doo ending is what really turns me off. Hahaha ... a Scooby-Doo ending. That's funny. Yeah, it gets annoying when the character should obviously know something, but comes across ridiculous. Lol, on the Scooby-Doo ending. Thanks for the heads up on this one not being creepy despite the awesome cover. I did like the historical novels by this author so I was looking forward to it. Glad it worked for the most part. Jo didn't bother me, I felt her nativity and book smarts made sense giving her environment. Wonderful review Melissa. Creepy cover! I don't think I could stomach Jo. Great review! A shame you didn't enjoy this one as much as you hoped. Naive characters are hard to like at times! I wouldn't expect a story like that either and the fact that the characters are like that would have annoyed me as well. mainly the naive side. This does seem different than I expected but the mystery sounds great. If I don't like the main characters then that's a big fail for me. Sounds like they weren't that great. Sorry it wasn't a better read, with that cover it should have been! Great review!